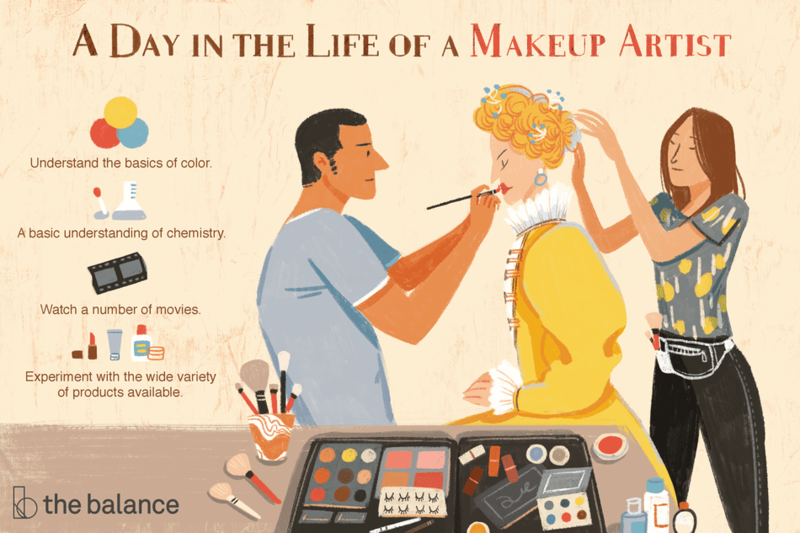 What Does a Movie Makeup Artist Do? A makeup artist does everything from making Cameron Diaz look completely flawless to turning Arnold Schwarzenegger into a Terminator. It is an essential part of the entertainment industry as it helps breathe life into a character by making them more three dimensional. An actor has a much easier time being able to commit to a role if they truly believe that they have been transformed into the character they are playing. This belief is mandatory for the audience as well. For us to buy the story, we need to believe that there is actually a robot under Schwarzenegger's skin, or that Jennifer Lopez has bruises on her face, or whatever. Key Makeup Artist: They are in charge of the makeup department. They actually design the makeup for each actor/actress and assign individual makeup artists to apply it. Makeup Artist: These are the individuals who apply the makeup to the actor. Makeup Assistant: They help with some of the lesser tasks like body makeup and organization. Makeup Effects Artist: They design and create special makeup effects using prosthetics, latex, and animatronics. A movie makeup artist's salary varies based on the level of experience, geographical location, and other factors. The job of a movie makeup artist is creative and rewarding, and does not necessarily require a college degree or certificate. Assistant work: Becoming a makeup artist is no easy task, especially depending on where you want to work. Many makeup artists get their start by first working as assistants on a movie set or television show. Their first gigs are usually on student films, low budget features or television which are the perfect training ground. Many actors and actresses develop relationships with makeup artists and often request them by name at the beginning of a project. Education: Cosmetology school is an important step toward becoming a makeup artist. It's not mandatory, but it gives you a solid educational foundation on which to continue building your career. In Los Angeles and New York, there are numerous schools that offer make up for film and television classes which will not only help you learn the craft but will introduce you to others in the industry. You might also consider taking a class in color theory which will help you to understand the basics of color. Hands-on experience: Experiment and familiarize yourself with the wide variety of products available. Watch a number of movies and see what a makeup artist did to achieve certain looks and experiment on your own. To become a makeup effects artist, you'll want to have a basic understanding of chemistry as many of the pieces you develop will be quite technical. Portfolio: It helps to have a portfolio of your previous work to show off the quality, creativity, and breadth of your work. Creativity: Movie makeup artists need to understand the different shapes and features of a face and body, and understand how to best highlight them or camouflage them, depending on the costume needs. Communication: A good part of a movie makeup artist's day requires working closely with models, actors, photographers and other clients or customers. It's important to be able to communicate well with different people to understand their goals clearly and provide needed feedback. Time management: Movie makeup artists have to manage their time and other peoples' time as well. They must analyze each client's need and obtain the equipment and products necessary to finish the job within a set amount of time. Detail orientation: Movie makeup artists need to complete their work under pressure while paying attention to fine details. Some of their jobs may require extended periods of deep concentration to complete meticulous requests. Movie makeup artists must also be able to reason and solve problems, weigh various costs against benefits, and come up with new ideas and creative ways to implement them. The movie makeup artist profession is a subset of a larger group of cosmetologists, who work with makeup, hair, skincare and other related areas. According to the U.S. Bureau of Labor Statistics, the outlook for cosmetologists over the next decade relative to other occupations and industries is strong, driven by an increase in advanced makeup, skin, and hair treatments, and an increase in the general population. Employment is expected to grow by about 13 percent over the next ten years, which is faster growth than the average for all occupations between 2016 and 2026. This growth rate compares to the projected 7 percent growth for all occupations. Movie makeup artists often work on the production set of a movie in progress. The hours are often quite long and initially, the pay may be extremely low, but if you remain tenacious, you will achieve your goals. Look at job-search resources like Indeed.com, Monster.com, and Glassdoor.com for available positions. Join industry groups and attend events that center around makeup in the movie industry to meet contacts that may help you locate job opportunities. Offer to assist a movie makeup artist on a volunteer basis or as an internship. This can help you build your portfolio to show during future interviews.